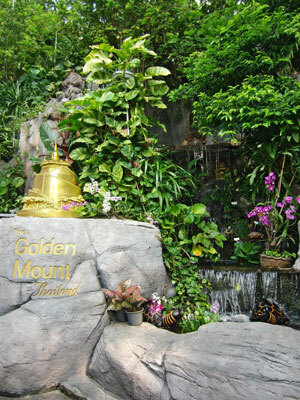 We started our last day in Thailand with a visit to the Golden Mount at Wat Saket. 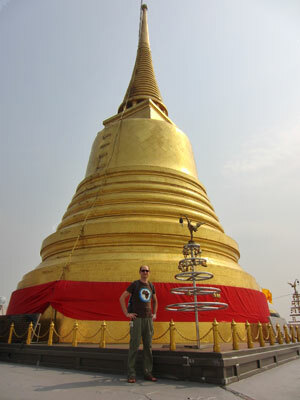 On top of the 79 meter high, artificially raised hill stands a golden Chedi. Even in the morning the climb was quite taxing, but the view from the top is worth the effort. 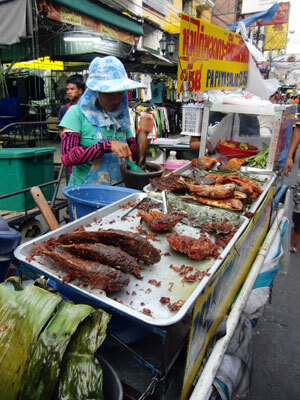 Later we took a boat on Khlong Saen Saep to Pratunam in the East, where many of the big shopping centres are located. The conductors sell the tickets balancing at full speed on the boat's rim. Most of them were at least wearing helmets, which is indeed a good decision considering the low bridges being passed on the way. 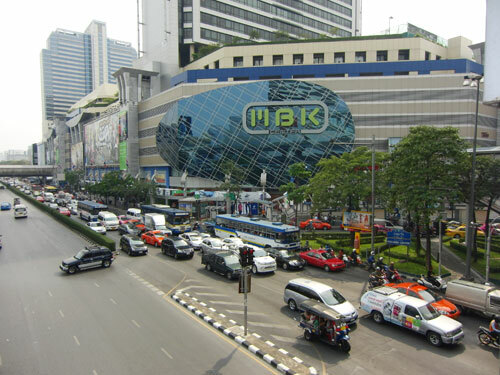 We visited both MBK Center and Siam Paragon, the latter one of the most exquisite shopping malls in Bangkok. All the luxury labels are represented, and even Bentleys and Maseratis are for sale here. However, the price level for designer clothes is the same as in Europe. All in all we felt that we would not have missed much if we had not come here, except for the boat cruise, of course. But this might also be due to the fact that we generally don't care too much about shopping and designer labels. 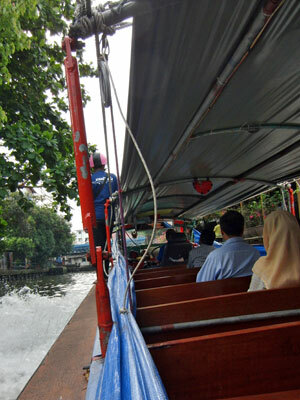 Anyway, we liked the old part of Bangkok at the river much better. 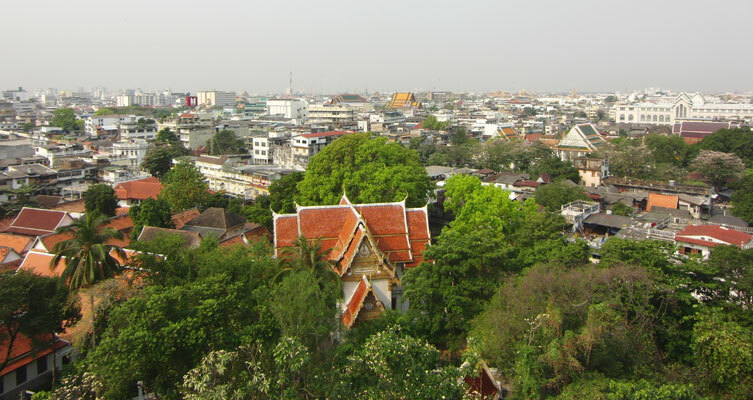 We spent the rest of the day at the hotel and in the late afternoon we went to Khao San Road once more to get some authentic food and fruit shakes. Also, a banana roti had to complete the meal. We ordered a taxi to the airport and around midnight our plane took off for Vienna. 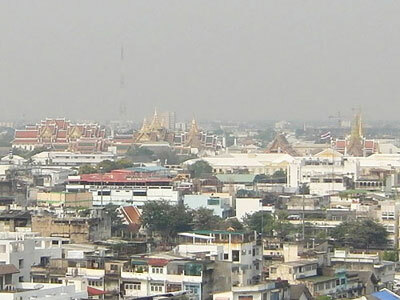 Sawasdee krap, Thailand!!! To sum things up: Thailand certainly was worth the trip! Even though I was no great Asia enthusiast before, I really enjoyed everything from the cultural sights to the beautiful nature and the delicious food. 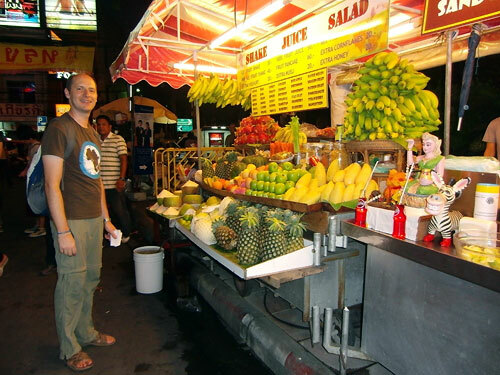 Thai people are so friendly and helpful and now I can easily confirm what everybody had been telling me all the time anyway: it is really easy to travel around on your own, even for Asia newbies. 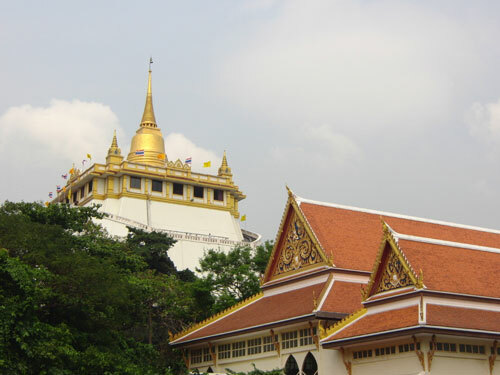 However, it was very convenient having booked all the domestic flights and accommodation ahead - in just three weeks' time it would simply be too time consuming to look for a hotel every couple of days.